Northwestern College is adding a statistics major to its undergraduate programs beginning in the fall of 2019. “This new major will prepare students for careers in any industry or organization that is collecting data and trying to make decisions based on that data,” says Dr. Kim Jongerius, chair of the department of mathematics and physics. According to Jongerius, while many companies don’t need an actuary to do statistical analysis, they do need someone who knows how to organize, interpret, and use data effectively and appropriately. They also need employees who will think about and work with data in an ethical way. 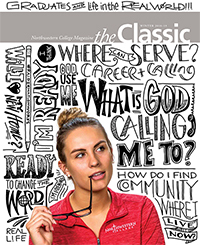 “At Northwestern, our entire curriculum is focused on teaching students to follow Christ and lead Christian lives, which includes behaving and thinking ethically,” she says. The new major will also prepare students for graduate school in programs such as statistics, mathematics, predictive modeling, and predictive or business analytics. Five new courses were developed for the major covering statistical design and programming, data validation and visualization, and advanced regression and Bayesian analysis. Students majoring in statistics will learn R, a programming language and software environment for statistical analysis, graphics representation and reporting. “When we teach students R, they will learn not only how to work with the data themselves, but also how to show it to other people who aren’t statisticians in a way that will make sense to them,” says Dr. Jennifer Schon, Northwestern’s associate director of institutional research. Schon will teach many of the new courses for the major, along with Dr. Tim Huffman, professor of mathematics and director of the actuarial science program. Other required courses include Calculus, Linear Algebra, Database Management Systems, and Probability and Statistics.